The situation: You’re getting chilly in your Phoenix home so you turn on the heat, expecting a rush of warm air in response. And yet you get nothing because your furnace isn’t turning on. But because you’re a self-sufficient homeowner, you decide to do a little troubleshooting yourself before calling in a professional. The good news is we’re here to help. Don’t worry, we’ll walk you through some troubleshooting steps to help pinpoint the issue. Hopefully, by the end you’ll have solved the problem. If not, though, just reach out for some help, we’ll be happy to fix your furnace. Is your thermostat working correctly? Think of your thermostat as the “middle man” between you and your thermostat. When you want heat, your thermostat is responsible for relaying that message to your furnace. So, if your thermostat isn’t working correctly, your furnace simply doesn’t know to turn on. Replace batteries if needed. First, check the display on your thermostat. If it’s blank, the batteries are possibly dead. Make sure the thermostat is set to HEAT. It’s easy to forget to switch your thermostat from COOL to HEAT. But checking for this now may save you from scheduling an unnecessary (and embarrassing) service call. Turn up the set temperature. Make sure that the set temperature is at least 5 degrees higher than the current room temperature. This tells your thermostat to call for heat now. Listen for the “click”. When the thermostat sends a signal to your furnace successfully, you’ll hear a soft click at the unit. You can listen for this by turning up the heat on the thermostat while a friend stands by your furnace listening. If you don’t hear that click, you know there is a problem with your thermostat. Have a professional inspect it to see if it needs repair or replacement. Is your furnace getting the electricity that it needs? Even if your furnace is an oil or gas-fired furnace, its motors still need electricity to operate. So if it’s not getting the electrical power it needs, it won’t turn on. First, check that the power switch is on. 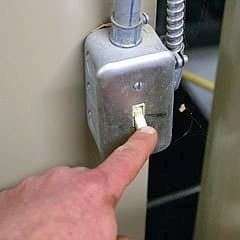 Your furnace’s power switch looks a lot like a normal light switch and may or may not be located on the furnace itself. So it’s possible that someone flipped the switch not knowing what it really was. Next, check to see if your furnace tripped the circuit breaker. For this, you’ll need to check your main electrical panel. Find your furnace’s circuit breaker (it should be labeled as furnace) and check that it is in the ON position. If your furnace circuit breaker tripped, it will point in the opposite direction from all the others. 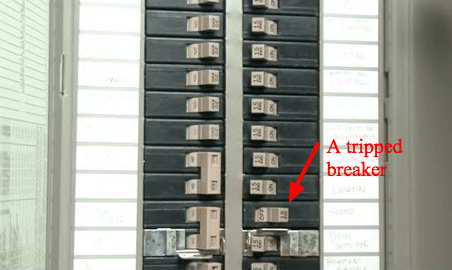 If it’s not in the ON position, firmly press the circuit breaker back in line with the other breakers. If it stays in the ON position, try turning on the heat again as it should work now. If it automatically flips back to the OFF position, call a professional. Don’t attempt to flip it back or find the problem on your own. Does your furnace have enough fuel? Have a gas or oil-fired furnace? Your furnace might not be starting because it isn’t getting enough fuel. If you have a gas-fired furnace (and you paid your gas bill), check to see that the gas valve feeding your furnace is turned on. If you have an oil-fired furnace, find the oil gauge and check the level of oil left in the tank. 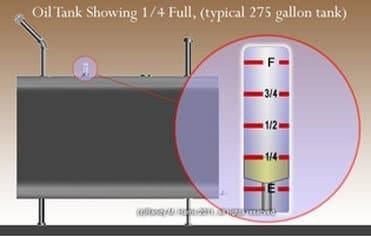 The gauge is usually positioned on top of the tank itself. There are various types of oil gauges but all are straight-forward and easy to read. If you’ve check all of the above and your furnace still isn’t turning on, there could be other issues that you’ll need a professional to handle. If you live in the Arizona area, just schedule your appointment today and we’ll send out an experienced tech right away. Central Air Conditioner Blowing Hot Air?